Inspiration: I really wanted to capture the personality of this little guy. Being 5 weeks old already, I knew that he was probably going to be awake the whole time, so I set out to catch all his adorable facial expressions and the connection between him and his parents. This happens to be my own little nephew! So I was also inspired simply by seeing my sister and her husband being first-time parents. Favorite Element: My brother-in-law is in the Canadian military and wanted a few images done in his dress uniform. I loved the combination of that bold red coat with the gentle way he was holding the baby. North facing window light was another favorite element here, and my sister’s house had plenty of it. Biggest Challenge: This was one hungry baby! He was in the middle of a growth spurt, so we had short windows of opportunity when he wasn’t being fed, burped, or changed. But when all the stars were lined up right, he was nice and happy! 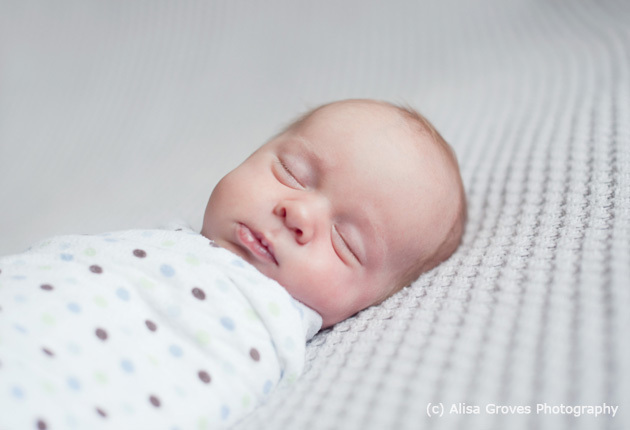 Photographer’s Final Words: Although I recommend photographing new babies before they are 2 weeks old, I don’t think it’s ever too late to have that first photo session. If parents have missed the newborn window, there are still so many special little things about a baby in those first couple of months. They grow and change so quickly – and they will never be as small again as they are right now! What an honour! Congratulations Alisa! Beautiful pictures of a wonderful and special session! Absolutely beautiful! Great captures of such a vibrant personality!